Blog about the latest in mathematics, especially A-Level maths in the UK. There has been a lot of interest in code-breaking recently - cryptography to use the posh word. You may remember the secret message attached to a pigeon's leg, found mysteriously in somebody's chimney, a message that still baffles cryptographers 70 years after it was written. Alan Turing was one of the finest British code-breakers during World War II. Some of his work, along with the work of others at Bletchley Park, is supposed to have shortened the war by perhaps 2 years. 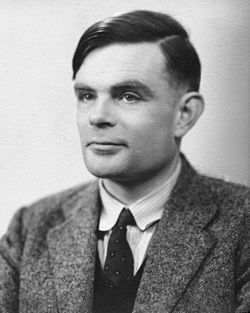 After the war, Turing went to Manchester University, where he helped to develop one of the country's first computers. To celebrate his life and work, Manchester University are running a code-breaking competition to begin in the New Year. The competition is open to secondary school pupils up to Year 11 (England and Wales), S4 (Scotland) or Year 12 (Northern Ireland). It runs from January to April 2013 and is based on a story that runs in six episodes. In each episode there is a new code-breaking challenge to solve. To enter the competition, you will need a team of pupils. The website features a discussion forum and a leaderboard. Prizes are Amazon vouchers, with members of the winning team receiving £30 of vouchers each and a trophy for the school. If you think you're up to the Turing Challenge, have a go and good luck!